The University of Edinburgh: bafflingly majestic, with a rich and mind-blowing history. The ancient university, known for educating minds like Charles Darwin and John Witherspoon, was founded in 1582, at the exact time when Europe was juuust adopting the Gregorian calendar. It’s so old, it was literally founded when our ancestors from five centuries ago began adhering to the calendar we follow today. Just digest that fact for a second. As the sixth oldest English university, the University of Edinburgh has a lot of hype to live up to—and it does. Consistently ranked in the top 50 universities globally and top 10 in the U.K., Edinburgh is considered prestigious inside and out of the U.K. Also, Edinburgh offers 1,200 international opportunities around the globe, accounting, in part, for the 94 percent of graduates who gain employment straight after completing their degree. Hooray for positive job prospects! But what are faculty doing? Well, here’s a clue: they grow sheep. And I don’t mean breed sheep. I mean, faculty from Edinburgh literally cloned a sheep from an adult somatic cell. I guess there weren’t enough wandering around on the Highlands? Or perhaps the shepherds needed more company? Nonetheless, their achievements in cloning have pioneered a path in scientific advancement previously believed to only be possible in science-fiction novels and movies. Now we’re cloning sheep; in thirty years, could we be cloning…our children? Shudder. Additionally, the faculty was also the first to create the vaccine for hepatitis B, and to engineer an automated industrial assembly bot. The bot is for making more sheep, no doubt. The freedom given to students to assess the faculty should not be overlooked. The Edinburgh University Student’s Association, or EUSA, has created a program that allows students to acknowledge faculty members who have contributed positively to students’ lives. This program has been so fruitful, it’s now mirrored in many other U.K. universities. The university is cheaper than most, if not all, private universities in the U.S. Beginning at 1,820 pounds for locals, and ascending to 23,200 for international students, Edinburgh offers affordability for those students motivated enough to study in a prestigious environment. However, as with any old school, you may occasionally be met with elitist vibes—but don’t let that get to you. There are over 30,000 students in attendance from over two-thirds of countries on the globe, so just avoid the pouty well-dressed kids and you’ll be a-okay. Considered one of the most desirable places to live, globally, the University of Edinburgh is a gem located in a gem of a city. The capital of Scotland, Edinburgh is the pinnacle of architectural and historical achievement, as well as of natural beauty. Combining the allure of ancient Greece, London, and pretty much every other European capital into one, Edinburgh could easily deprive you of breath with just a glance. One walk through the city is not enough to appreciate all of the local attractions. Situated on the coast, Tantallon Castle in North Berwick, offers any Game of Thrones lover a fix with its imposing presence. The Blackness Castle, an even more commanding and darker (ba-dum-tis) monument located again directly by the sea, also provides this pleasure. And lets not ignore the sea itself, and the beaches it offers - they are fab. The most (arguably) beautiful is the Portobello Beach, it is not to be missed. However, if Middle Earth is more of your forte, you can head out to Pentland Hills Regional Park, and befriend Scottish sheep in the middle of what one could only describe as a fantasy realm. I’m just going to add in a picture about every two sentences because I can’t get enough of this. I MEAN, JUST LOOK AT IT!!! Forget writing an article, a picture is worth as much as a thousand words. And pictures like this…maybe ten thousand. A hundred. Heck, a million. There are downfalls to this mystical domain, including bad weather and campus buildings being haphazardly dispersed around the city. Students have also complained about the food culture, but I guess that depends on your taste. Besides loping around with sheep (including cloned sheep) or possibly playing Quidditch in the many castle grounds Edinburgh has to offer, there are many other activities to get involved in inside the university and out. The University of Edinburgh offers over 280 clubs to join. Allow me to repeat: two-hundred and eighty PLUS clubs. Even just scrolling through the A’s, you can find intriguing activities to join in on: the African Drumming Society, the Anarchist Society and the Arabic Bellydancing Society are only a few. The university also allows unlimited opportunities to volunteer in whatever cause you may be passionate about. In the university’s mental health weeks, put on from time to time, countless forums concerning mental health are offered, including mental health awareness, men and women’s mental health, mental health in STEM (science, technology, engineering and math), mindfulness and yoga days, discussions about depression, fear, and failure, and many other meet-ups having to do with these crucial issues. It’s not often one university offers so many different opportunities to discuss an issue that continues to attract stigma, and it should not go unnoted. “When the university is advertising to prospective students, it typically focuses of on these attributes as well as the academic rigour and the 300+ societies and sports teams. While everyone who visits experiences the city’s charm; the winding streets and the castle’s commanding view but often Edinburgh’s vast green space is forgotten as one of its best attributes. 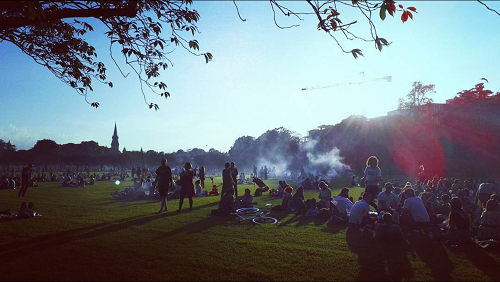 Edinburgh is 49.2% green space, we have a volcanic plug known as Arthurs seat right in the middle of the city and the meadows are a huge open green space right behind the university where students congregate in the summer for BBQs and to have their lunch during exams," said Aimee Keown, a current student at the University of Edinburgh. “Blackford Hill sits at the back of the Marchmont where most students live and the Pentland Hills are a 20 minute bus ride from the city centre and I can’t forget Calton Hill at the end of Princes Street which gives a view of the main shopping area and across the firth of forth. The city is beautiful but the green spaces are varied and accessible. With the ever increasing pressures of student life there is nothing better than to be able to go for a walk outside and feeling as if you have completely left the city. 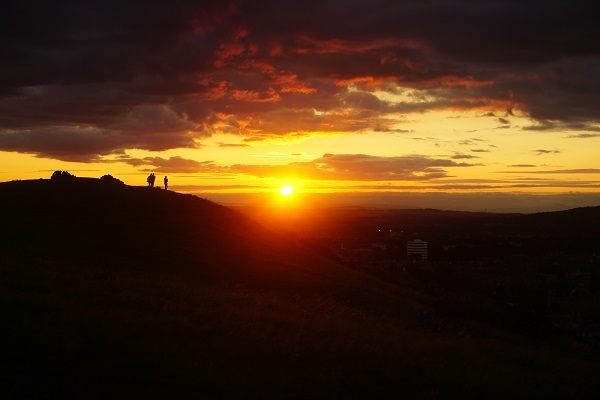 I have been studying here for 5 years and every time I enter Holyrood park, home of Arthurs seat, it takes my breath away," Aimee on Blackford Hill and her experience at the University of Edinburgh. The university also offers Global Students’ projects, allowing students to learn new languages, befriend international students or play a part in Global Students Day—a day of celebrating diversity with different events involving mindfulness, dance, or gardening, for instance, with students from all nooks and crannies of the globe. A heartwarming display of boundless togetherness. All in all, it’s difficult to say anything bad about the University of Edinburgh. Given its Hogwarts meets Lord of the Rings kind of vibe, and its sheep-cloning tendencies, how could I? But I guess it’s up to you to come here yourself and find out. - Ruby G.
Why Study at the University of Warwick?